Probably one of the most interesting, easily-accessed, and least-documented sites-of-interest for Windward Oahu kayakers is a plane crash site, a mere half-mile off Popo'o Point at the end of Lanikai, in Kailua. Indeed, I had been paddling right over the top of it (well, so to speak) for 25 years before Bob Twogood made mention of it in one of his email newsletters, and I just had to join his group to find out about it. Lo and behold, there it was, in 15 to 20 feet of water, right next to the right-hand Mokulua island (Moku Iki), all of a 30-minute paddle from the Lanipo Drive Access beach. But you definitely have to have someone take you there the first time - it's just not that obvious, even when you know where to look! 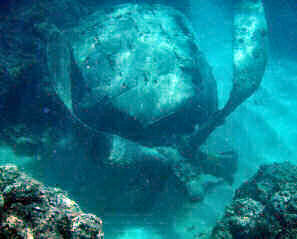 The reason it's hard to find is that the plane is broken into 3 main pieces which lie in the gullies between the coral heads. Unless the water is dead flat and clear, the wreckage just looks like more coral heads. 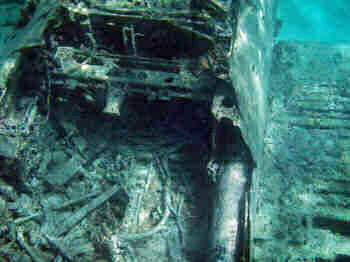 The engine, with bent props, lies about 25 feet from the cockpit and wing pieces, and the rudder is missing. Alga grows thick on the fuselage, further camoflaging it. The story behind the wreck is this: one fine day in 1947 (see note below), an unknown airman was taking off from the "new" (added in 1943) bomber runway at Bellows Airfield in Waimanalo, on a routine training flight in a P-47 Thunderbolt when the engine completely conked out. A short glide, and the plane hit the shallow reef offshore, skidding along on the coral until it came to a halt about 800 yards from the end of the runway, perched on the edge of the reef in about 3 feet of water. The landing gear was sheared off, the propeller mangled and the engine full of saltwater, but the pilot was allegedly unharmed, perhaps only worried about how this was going to look on his flight resumé. He could, and probably did, walk back to the airstrip. The next day, the Army declared the plane a write-off, removed the armaments and electronics, and left the carcass to the elements (ah, those were the days). The wreck, I am told, was still visible from Lanikai until the mid- '70s, when a particularly nasty storm moved it into slightly deeper water off the edge of the reef, breaking it up into pieces as it did so. And there it stays, just waiting for you. When I accompanied Bob out to the wreck in 2007, he didn't need no stinkin' GPS to find it. 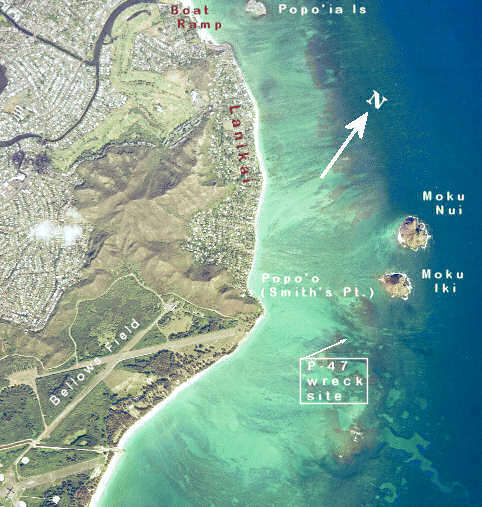 From the channel on the east side of Moku Iki, he went into deep water and approached the site from the ocean side. The reason was that there was a slight ocean swell, the tide was low, and the coral heads were just barely submerged, making it difficult, not to mention hazardous, to approach from the land side. Just as we got to an unremarkable point on the edge of the reef Bob announced "This is it!" 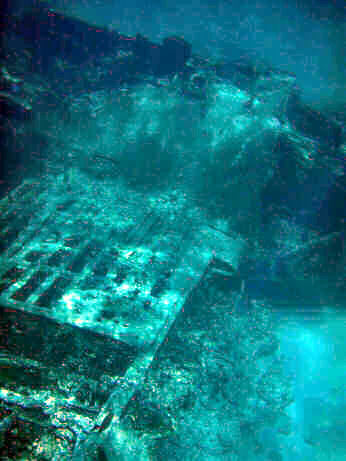 Swimming a couple dozen feet away I located the engine, virtually intact. The four blades of the huge (12') prop were bent back against the cowling, and the exhaust headers sticking out the back revealed it was a radial engine, both giveaways that this was indeed a Republic P-47 Thunderbolt. Not as aesthetically pleasing as its predecessor the P-40 (think Flying Tigers), it was nicknamed "The Jug" for its stubby look†, but it was the fastest (almost 500 mph), most expensive, and most-manufactured fighter plane of the war, credited with the most enemy kills and materiel damage of any WWII plane. It was also the heaviest (12,000 lbs! ), so no wonder it couldn't turn around and coast back to the airstrip. The ocean surge between the coral heads was starting to get a bit troublesome, so a few snaps on my waterproof camera, and we were on our way to the beach at the Mokes. I had the presence of mind to get the GPS coordinates (sorry Bob!) before I left (see below), so we can make it a regular stop on future paddles. If the weather co-operates, that is. Notes: in doing background research into the crash, I came across some wonderful websites about Bellows Airfield, before, during and after WWII, most notable of which is Abandoned Airfields of Hawaii, a very deep site run by Paul Freeman, and piles of sites about the P-40, P-47, and Seversky Aviation (later to become Republic Aviation Co.), the best of which are Warbird Alley, and Aviation History: the P-47.